If you happened to be within spitting distance of either Nicki Minaj’s or Cardi B.’s social media accounts last night, then you know it was a wild one. 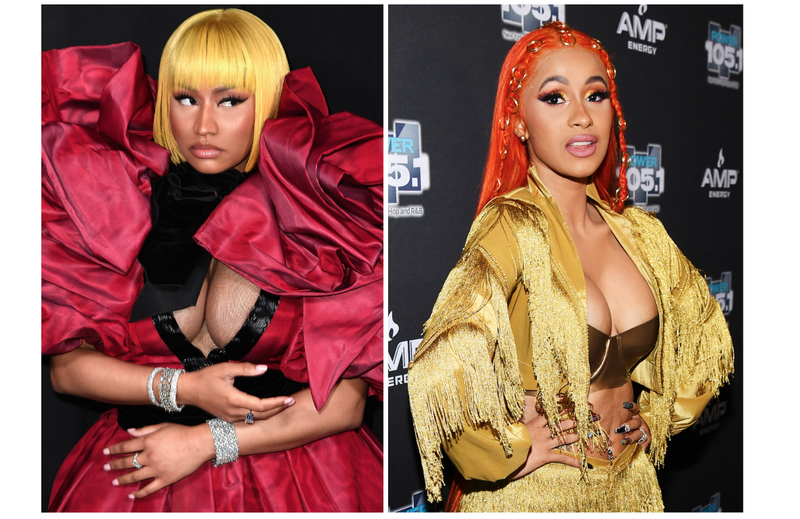 Their beef, which had been simmering all weekend, thanks to an online back-and-forth between Cardi’s sister, Carolina Hennessy, and Nicki’s friend, Rah Ali, finally spilled out of the pot (again) last night, after Nicki addressed the allegations on her Queen Radio talk show. Wigs flew, clowns came back to bite, tea was spilled, pearls were clutched, receipts were waved, and Barbz (aka Camp Nicki) and members of the BardiGang (aka Camp Cardi) were ready to risk it all for their faves. And in the background were people like me, who say we really don’t care all that much about the drama between the two rappers, but who, out of sheer curiosity and FOMO, found ourselves discreetly nibbling at the Bardi/Nicki beef like Russell Westbrook trying to sneak a snack on the bench. So, if you’re like me, and want to find out what happened so you can quickly go back to “not caring about it,” here’s your cheat sheet, presented in chronological order. Nicki hops on “Queen Radio” on Monday afternoon to address rumors that her security team beat up Cardi B at the Harper’s Bazaar Icons event during New York Fashion Week. Nicki claims pal Rah Ali punched Cardi B “9 or 10" times. The Queens rapper paid $100,000 for surveillance footage of the fight that night, as well as claiming she had video of her own. Nicki denies that she leaked Cardi’s number to her Barbz, which Cardi’s sister, Carolina Hennessy, alleged. Was initially offered Nicki’s Diesel jeans partnership before Cardi passed on the offer (people still wear Diesel jeans? ), as well as declining a chance to feature on a Little Mix song Nicki eventually featured on. Cardi invites Nicki to talk it out or just fight already. Nicki counters back, on Twitter and in Instagram comments, tapping her inner Maury Povich and inviting Cardi to take a lie detector test on her podcast, and accuses the Bronx hit-maker of not writing her verses. For some reason unbeknownst to anyone with common sense, Wilhelmina CEO Bill Wackermann waded into the tumultuous Instagram waters and claimed the Diesel campaign was always built around Nicki. Cardi, apparently perched on Instagram like a merciless macaw, quickly posts receipts—i.e. emails of the Diesel contract offered to her. She also forgets to blur out the email accounts (Cardi! Think of the notifications! The overflowing inboxes! The rabid Barbz! The humanity!). Wackermann deletes his Instagram account post, because bruh. No one wants that Nicki/Cardi crossfire smoke. Nicki continues to ask Cardi where her pen’s at. Cardi asks Nicki where her #1 songs are at. We reach peak “everything is funny right now” and everyone’s face melts off. The person (or people) running The Shade Room’s Instagram account finally exhales and rests their weary fingers, which had been flying for the last 4 hours (seriously, we owe y’all a drink...or 10). People who think “females” only started rapping in 2010 find something else to do with their time (or not).